In the global arena of government shipping, essential supply chain efficiencies and cargo protection are the first lines of defense in designing a secure and fully compliant logistics plan. 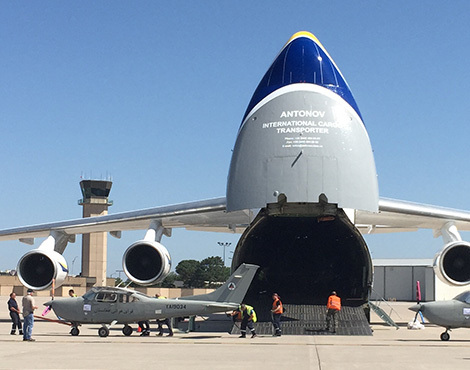 As a sustaining member with the National Defense Transportation Association (NDTA), AIT Worldwide Logistics is an industry leader committed to going beyond the call of duty in providing the proper equipment and extensive industry knowledge required to service all branches of the United States government. We offer our customers custom-built transportation solutions, data integration, Syncada™ payment processing and superior customer service for air, LTL/FTL ground and ocean cargo. Our CRAF (Civil Reserve Air Fleet) agreement enhances AIT’s capabilities to transport government commodities internationally. Central to our seamless, superior service is strict governmental compliance, allowing AIT to protect the security of cargo throughout the logistics pipeline. As a 2015 Corporate Distinguished Service Award recipient, AIT maintains the highest level of membership available in support of the NDTA's goals and programs. Leverage the expertise of AIT's government logistics solutions.